Sotheby’s New York December 9, 2014 Magnificent Jewels Sale promises to be a memorable event in the history of public auctions, with several jewelry collections with a distinguished American provenance, as well as jewels with Russian and European noble provenance lined-up for the sale. Among the jewelry collections with an American provenance are the jewels of Mrs. Estée Lauder, Mrs. Evelyn H. Lauder, Helen Hay Whitney, Matilda Dodge Wilson, Mario Buccellati and Luca Buccellati, Hannah Jonas, Lisa Blue Baron and also jewels from several unidentified collections, such as property of a prominent South Florida family, property from a San Diego, California private collection, property of a Midwest collector, property of a distinguished private collector, Los Angeles, California, property of a distinguished collector from New York, property of a prominent collector, Philadelphia, property from an American family etc. However, out of these collections jewels from the collections of Mrs. Evelyn H. Lauder and Mrs. Estee Lauder no doubt will be the main highlight of the sale, as proceeds from the sale would benefit two important charities, The Breast Cancer Research Foundation and the Alzheimer’s Drug Discovery Foundation. While thirty-three jewels from the collection of Mrs. Evelyn H. Lauder will be sold to benefit The Breast Cancer Research Foundation, an organization founded by Mrs. Evelyn H. Lauder in 1993, eleven jewels from the collection of Mrs. Estée Lauder will be sold to benefit The Alzheimer’s Drug Discovery Foundation. Sotheby’s had been in the forefront of these charity sales, and had previously auctioned jewels from the same collections in December 2012 and 2013 to benefit the Breast Cancer Research Foundation. Based on pre-sale estimates, diamond lots both colored and colorless are the top lots of the sale led by an antique Belle Epoque (1895-1914) piece from the estate of Helen Hay Whitney, Lot 414 – A Magnificent Platinum-topped Gold And Diamond Necklace. The magnificent jewel was one of several hundred priceless gifts received by Helen Hay Whitney at the time of her celebrated wedding to Payne Whitney in February 1902, attended by President Theodore Roosevelt and members of the United States Cabinet. The platinum-topped gold neckchain of the 43 cm. 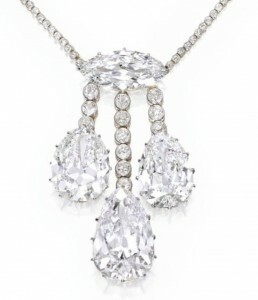 necklace is collet-set with circular-cut diamonds, which suspends a pendant setting with three diamond fringes supported from a horizontally-set 8.91-carat, marquise-shaped diamond centerpiece. The central longest fringe with six circular-cut collet-set diamond linear suspension supports a pear-shaped, 27.48-carat colorless diamond. The short side fringes supporting pear-shaped diamonds weighing 15.53 carats and 13.08 carats are set with three circular-cut collet-set diamonds each. GIA certifies that the 27.48-carat, pear-shaped diamond is F-color, VS1-clarity; the 15.53-carat pear-shaped diamond is G-color, VS-1 clarity; the 13.08-carat, pear-shaped diamond is F-color, VS-1 clarity; and the 8.91-carat, marquise-shaped-diamond is H-color, VS-2 clarity. A pre-sale estimate of USD2.5-3.5 million is placed on this antique Belle Epoque necklace. 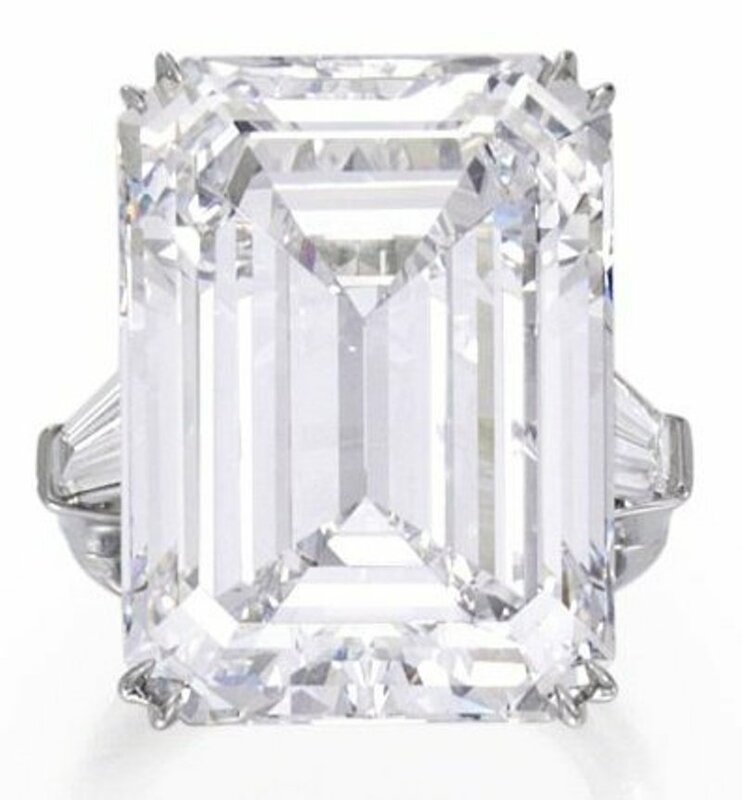 The other top lot of the sale with the same pre-sale estimate of USD2.5-3.5 million as Lot 414, is Lot 402 the property of an unidentified lady, titled “Magnificent Platinun And Diamond Ring.” The centerpiece of this ring is a 25.44-carat, emerald-cut, D-color, VVS1-clarity diamond, flanked by two tapered baguette-cut diamonds. GIA certifies the 4Cs of the diamond also providing a working diagram to show that the diamond may be potentially internally flawless. The next highlight of the sale with a pre-sale estimate of USD1.75-2.00 million is Lot 337 – An Impressive Platinum, 18k-gold, fancy vivid yellow diamond and diamond ring . 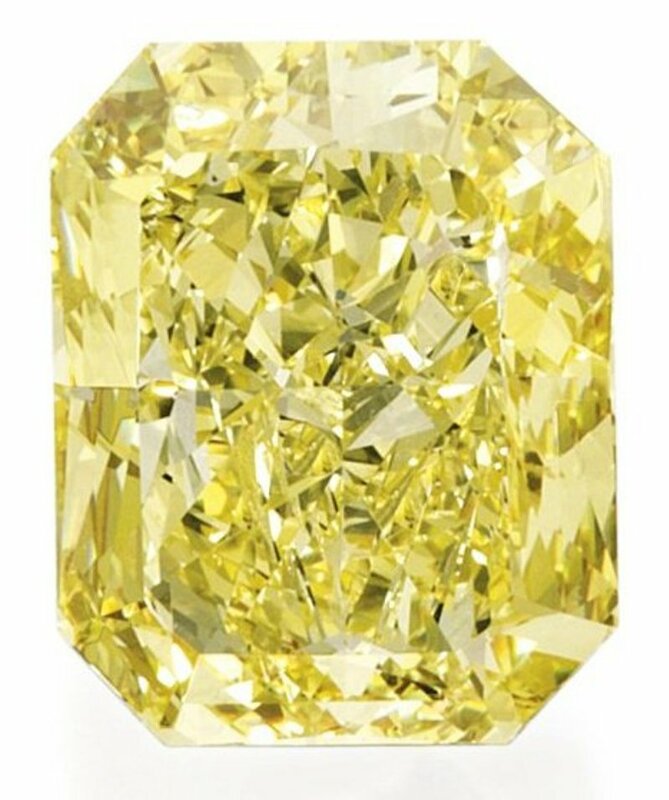 The centerpiece of this ring is a cut-cornered rectangular modified brilliant-cut fancy vivid yellow diamond weighing 30.48 carats, and the mounting set with colorless round brilliant-cut diamonds. GIA certifies that the 30.48-carat, cut-cornered rectangular modified brilliant-cut diamond is natural color, fancy vivid yellow, VS2-clarity. 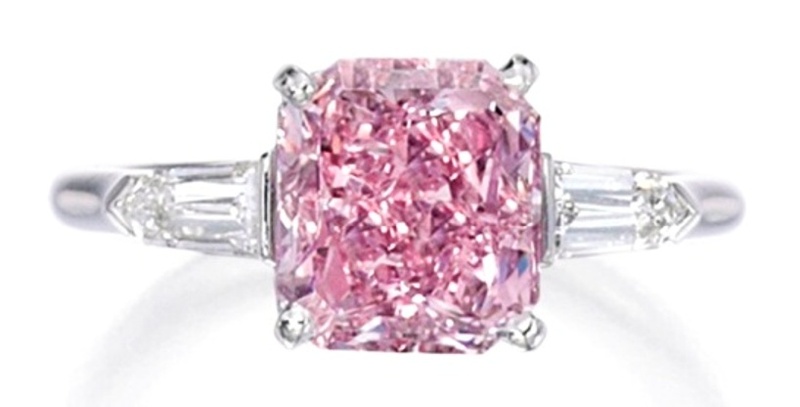 Lot 398 is another colored diamond lot with an estimate of USD1.10-1.30 million and titled A Fine Platinum, Fancy Intense Purplish-Pink Diamond And Diamond Ring. The centerpiece of this platinum ring is an emerald-cut, fancy intense purplish-pink, SI2-clarity diamond weighing 3.07 carats, flanked by two bullet-shaped diamonds together weighing 0.45 carats. A GIA certificate accompanying the lot certifies the natural color of the diamond and the 4Cs given above. Another colored diamond highlight is Lot No. 407 – An Impressive Fancy Deep Brown-Orange Diamond Ring – with an estimate of USD900,000-1,100,000, and simply identified as the Property of Another Owner. 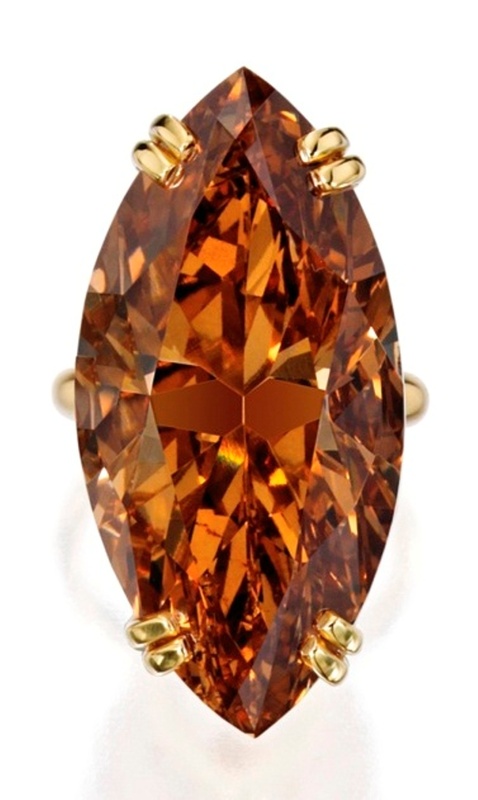 The 18k-gold ring is set with a marquise-cut, fancy deep brown-orange diamond weighing 50.34 carats. GIA certifies the natural color of the diamond, and its cut, color-grade and weight. Mrs. Evelyn H. Lauder’s collection will be led at the sale by Lot 395 – An Iconic Platinum, Colored Stone, Diamond And Enamel “Tutti Frutti” Bracelet by Cartier New York – with a pre-sale estimate of USD750,000-1,000,000. Designed as a flexible openwork foliate band by Cartier in 1928, the bracelet inspired by Indian craftsmanship is set with several carved emerald and ruby leaves; spherical onyx beads representing berries; the stem set with old European and single-cut diamonds weighing approximately 6.25 carats, enhanced with black enamel, further accented by faceted rubies on the terminals of the bracelet. Length of bracelet 6 7/8 inches.Signed Cartier, numbered 4896; circa 1928. 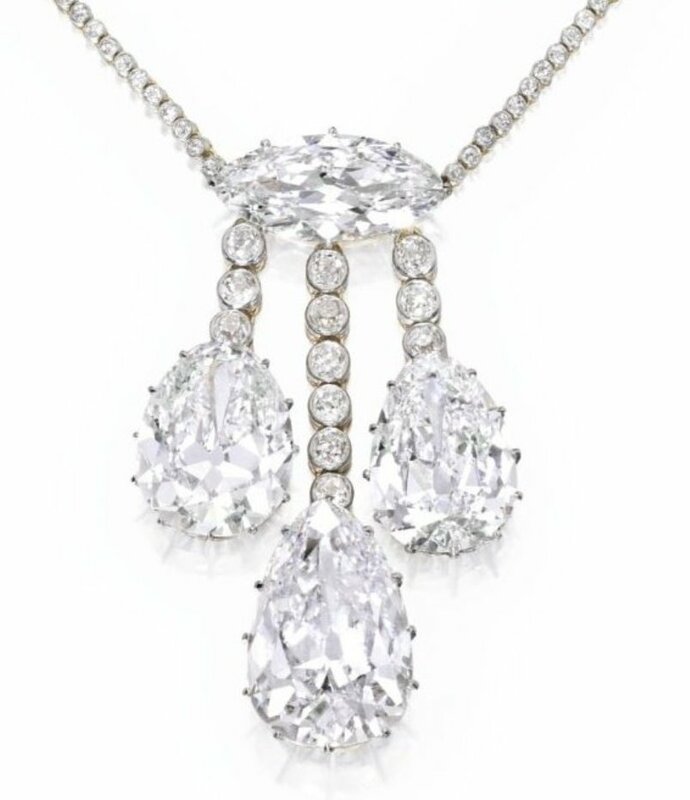 The next highlight from Mrs. Evelyn H. Lauder’s collection is Lot 389 – Pair of Platinum, Diamond And Mystery-Set Colored Stone Pendant Ear-clips by Van Cleef & Arpels – with a pre-sale estimate of USD200,000-300,000. 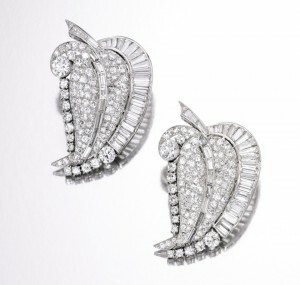 The feathered design tops of the ear-clips fitted with pendant hooks are set with circular-cut diamonds together weighing 5.00 carats. 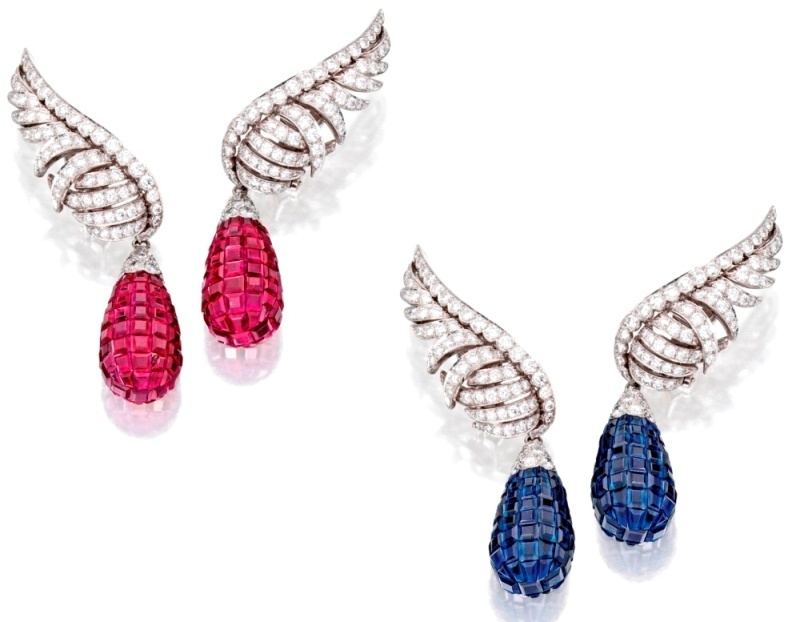 The ear-clips have two pairs of interchangeable pendants, one pair set with calibré-cut mystery-set sapphires, accented by circular-cut diamonds weighing approximately 1.30 carats and the second pair set with calibré-cut mystery-set rubies, accented by circular-cut diamonds weighing approximately 1.25 carats. Lot 394 from Mrs. Evelyn H. Lauder’s collection with an estimate of USD100,000-150,000 is a piece designed by Oscar Heyman & Bros.and titled A Platinum, Diamond, Sapphire And Emerald Bracelet. The 17.8 cm. bracelet crafted in 1925 is of openwork design and set with three marquise-cut diamonds weighing 1.95 carats, 1.80 carats and 1.80 carats; one placed at the center of the bracelet and the other two closer to the terminals. 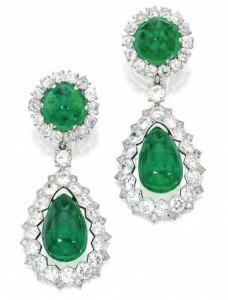 The three marquise-cut diamonds are highlighted by a caibre-cut emerald surround. On either side of each large marquise-cut diamond, three smaller marquise-cut diamonds are placed in the form of a trefoil. The central marquise-cut diamond in each trefoil is highlighted by a calibre-cut sapphire surround and two arches arising from it are also set with calibre-cut sapphires. Nine cabochon-cut sapphires arranged in five rows forming a rhomboidal design is placed between the marquise-cut floral designs. A single-layer diamond spiral set with circular-cut and old-European cut diamonds borders the sapphire rhomboid and the central marquise-cut diamond of the trefoil. The outer limiting layer of the bracelet and an inner layer parallel to this are also set with circular-cut, old-European-cut and single-cut diamonds. Mrs. Estee Lauder’s collection is led by Lot 388 – another Van Cleef & Arpels creation, titled A Pair of Platinum, 18k-Gold, Colored Diamond And Diamond Ear Clips, and with an estimate of USD100,000-150,000. 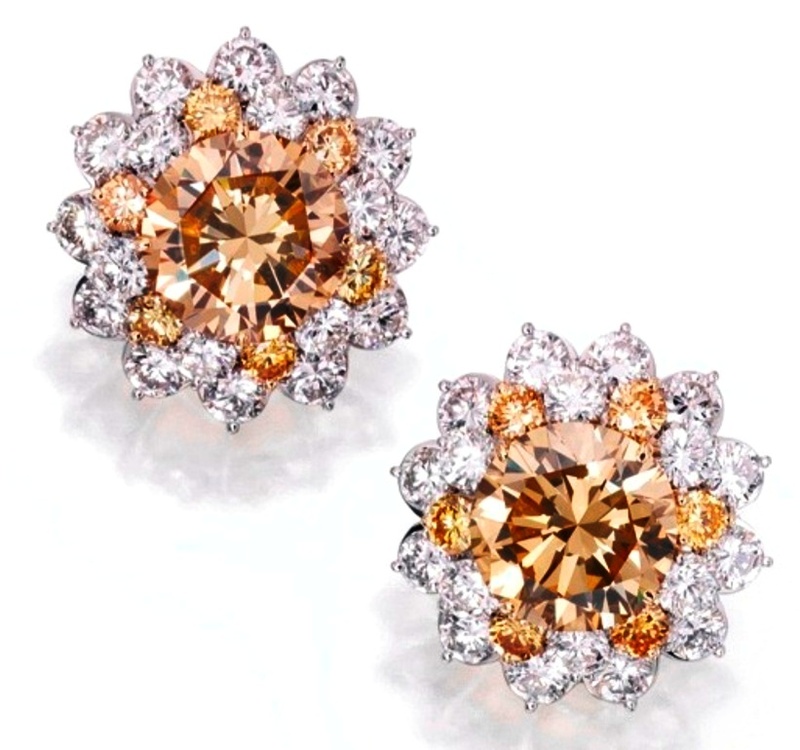 Each ear-clip designed as a floral motif, centers around a round brilliant-cut, natural color fancy brown-yellow diamond. While one fancy brown-yellow, round brilliant-cut diamond is a VS2-clarity diamond weighing 8.08 carats the other diamond is a VVS2-clarity weighing 7.74 carats. 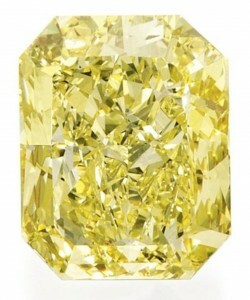 The central brown diamond is surrounded by two rows of round brilliant-cut diamonds resembling the petals of a flower. The inner row consists of 6 yellow-brown and 6 colorless round brilliant diamonds alternating with one another. The outer row consists of 12 colorless round brilliant-cut diamonds placed in positions alternating with the diamonds in the inner row, as in the petals of a flower. The weight of the 18 colorless round brilliant-cut diamnds is 8.50 carats and that of the 6 yellow-brown round brilliant-cut diamonds is 2.40 carats. GIA certifies the 4Cs of the central fancy brown-yellow diamonds and their natural origins. Lot 369 is another highlight from Mrs. Estee Lauder’s collection with an estimate of USD20,000-30,000 and titled A Pair of Platinum And Diamond Clip Brooches. The brooches designed as a matching pair of leaves have their petiole, midrib and one margin set with baguette and tapered-baguette diamonds, with a total weight of 6.20 carats. The remaing parts of the leaf and the lamina are set with circular-cut Old-European and single-cut diamonds together weighing 8.25carats. 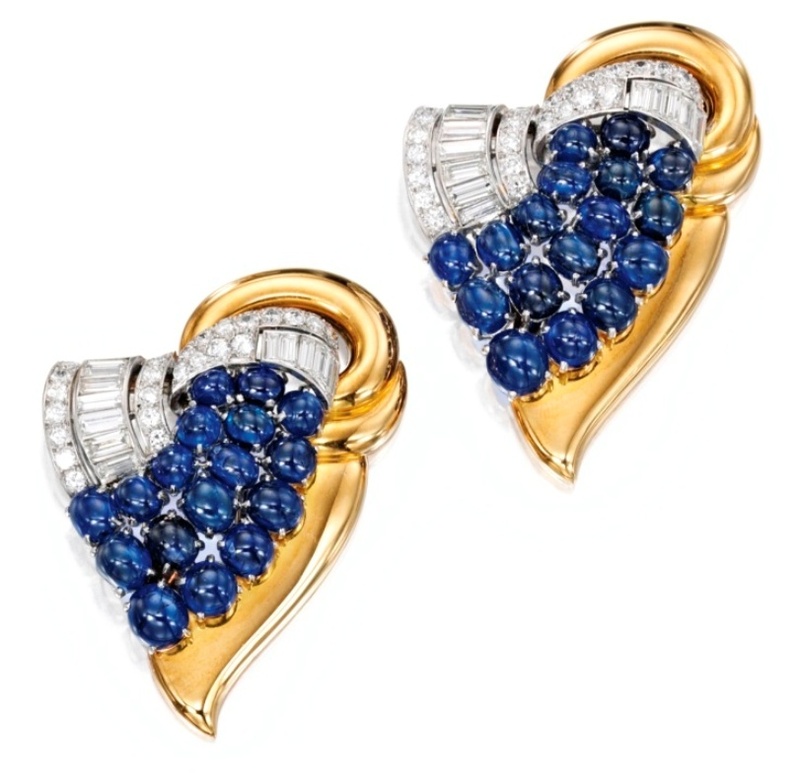 Lot 381 – A Pair of 18k-Gold, Platinum, Sapphire And Diamond Clip Brooches with a pre-sale estimate USD12,000-18,000 is another piece from Mrs. Estee Lauder’s collection that would benefit the Alzheimer’s Drug Discovery Foundation. Designed as triangular motifs in 1945, each brooch is set with 17 cabochon sapphires and accented with circular-cut and baguette-cut diamonds, within a polished 18k-gold frame. The total weight of the 34 cabochon sapphires is 30.00 carats and that of the diamonds 2.60 carats. Lots 378 and 356 are two more lots from Mrs. Estee Lauder’s collection with moderate estimates of USD7,000-9,000 and USD6,000-8,000 respectively. 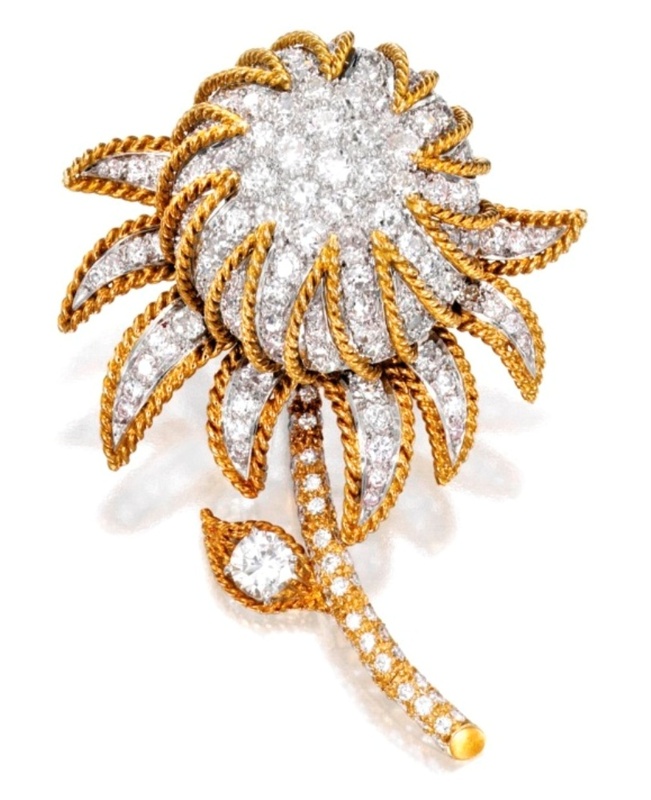 Lot 378 – An 18k Two-Color Gold And Diamond Brooch is designed as a flower motif with an articulated stem, set with numerous circular, old European and single-cut diamonds with a total weight of 7.00 carats. Lot 356 – An 18k Two-Color Gold, Cultured Pearl, Colored Stone And Diamond Necklace – is a 62 cm triple-strand necklace composed of 167 cultured pearls, varying in size from 7.7 mm to 10.3 mm. The clasp of the neckace is set with a button-shaped cultured pearl with dimensions of 10.4 x 10.2 mm, accented by small circular-cut diamonds. 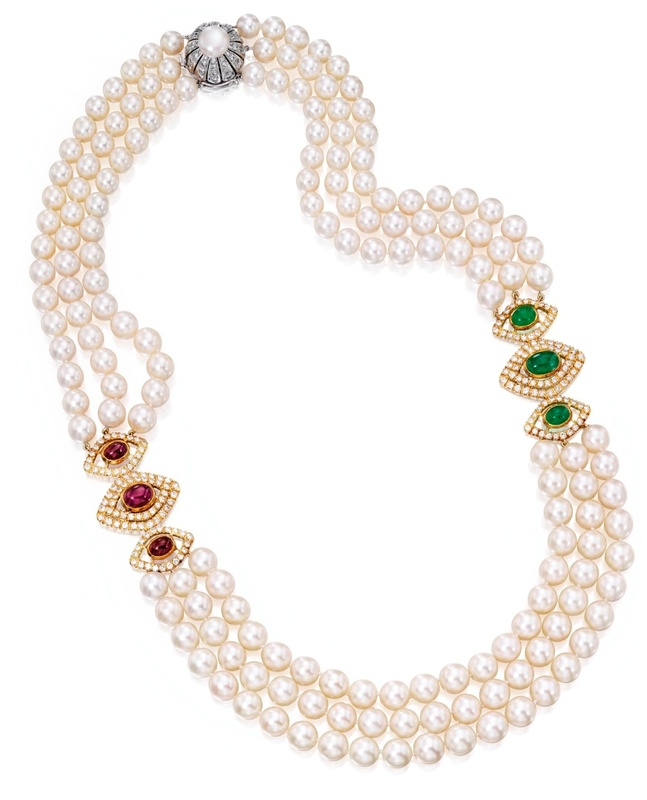 The cultured pearl triple-strand is interrupted at the sides by a set of three spindle-shaped links, one set collet-set at the center with oval-shaped cabochon rubies varying in dimensions from 7.9 x 5.7 mm to 9.7 x 7.5 mm and the other similarly collet-set with oval-shaped cabochon emeralds varying in dimensions from 7.7 x 6.3 mm to 10.7 x 7.5 mm. The central collet-set colored stone is surrounded by two layers of circular-cut diamonds and the smaller collet-set colored stones are surrounded by a single layer of circular-cut diamonds. Apart from the jewels from the collections of Mrs. Evelyn H. Lauder and Mrs. Estee Lauder that would benefit charitable causes other highights from the sale include a lot originating from the collection of jewels of the Grand Duchess Vladimir of Russia retrieved from the Vladimir Palace in St. Petersburgh at the height of the 1917 Bolshevik revolution by a British Secret Service agent who was also a close friend of the family. The jewels were safely deposited in a bank in England and were divided among the Grand Duchess’ four children according to her last will after her death in 1920. Her daughter Elena inherited several pieces of diamond, emerald and pearl jewelry some of which including the Grand Duchess Vladimir Tiara was sold to Queen Mary of the United Kingdom, Queen Consort of King George V. Elena who married Prince Nicolas of Greece and Denmark had three daughters by this marriage, Princesses Olga, Elizabeth and Marina. Queen Elena divided her jewels between her three daughters and Princess Olga received the emerald and diamond pendant earrings offered for sale in this auction as Lot 406. 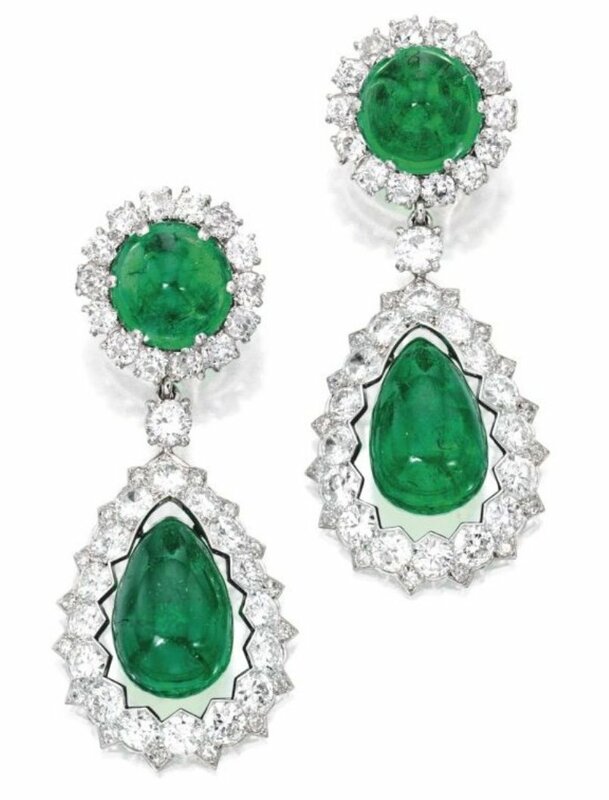 The Emerald and Diamond Pendant Earrings were sold at a Sotheby’s Geneva auction in November 1987, and was acquired by Prince Johannes von Thurn und Taxis for his wife Princess Gloria von Thurn und Taxis. The celebrated jewel was again part of the “Thurn and Taxis Collection” that appeared at a Sotheby’s Geneva auction on November 17, 1992 and was assigned Lot No. 418. The jewel was acquired by an anonymous collector and now reappears at Sotheby’s December 9, 2014 New York Magnificent Jewels Sale as Lot 406. The celebrated jewel said to be the property of a distinguished private collector is titled AN IMPORTANT AND HISTORICAL PAIR OF PLATINUM, EMERALD AND DIAMOND PENDANT EAR-CLIPS and a pre-sale estimate of USD600,000-800,000 is placed on the jewel. The pendant ear-clips are made of two drop-shaped emeralds with dimensions of 19.3 x 12.5 x 12.3 mm and 18.5 x 12.5 x 12.2 mm, suspended from two round cabochon emeralds, with dimensions of 12.8 x 12.7 x 8.0 mm and 12.8 x 12.5 x 7.8 mm, within diamond-set frames, set with circular, old mine and single-cut diamonds weighing approximately 17.50 carats. AGL certifies that the emeralds are of classic Colombian origin with faint to moderate clarity enhancement with oil. Another important colored stone highlight is Lot 156 – Silver-Topped Gold, Sapphire And Diamond Brooch, Austro-Hungarian with an estimate of USD600,000-800,000. 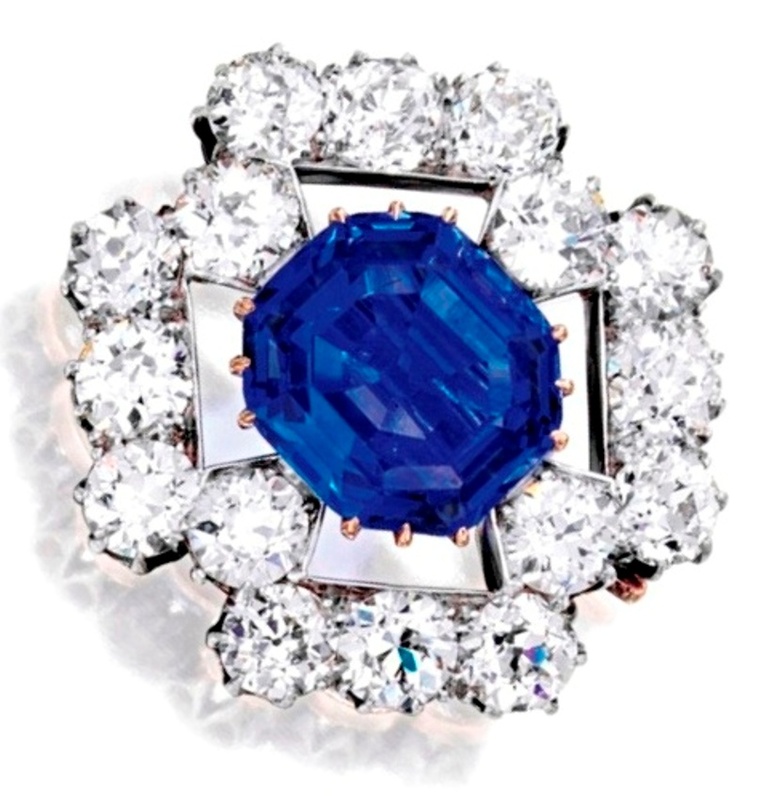 The brooch of Austro-Hungarian inspiration designed in the last-quarter of the 19th-century, centers around an octagonal step-cut Kashmir sapphire weighing 13.04 carats, claw-set at the center of a Maltese cross, framed by a layer of 16 Old European-cut diamonds which roughly follows the contours of the maltese cross, giving the overall shape of the brooch. 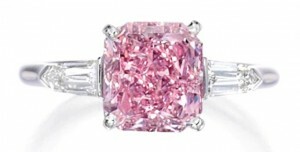 The diamonds together weigh 8.75 carats. Two lab reports by AGL and GGL certify the Kashmir origin of the blue sapphire with no evidence of heat enhancement. Lot 348 is another Kashmir sapphire ring, titled Platinum, Sapphire and Diamond Ring, with an estimate of USD360,000-400,000. The centerpiece of this ring is a cushion-cut, Kashmir blue sapphire weighing 6.36 carats, fanked by two trapeze-cut diamonds weighing 1.00 carat. Two lab reports by AGL and GGL certify the Kashmir origin of the sapphire, with no indications of heating. 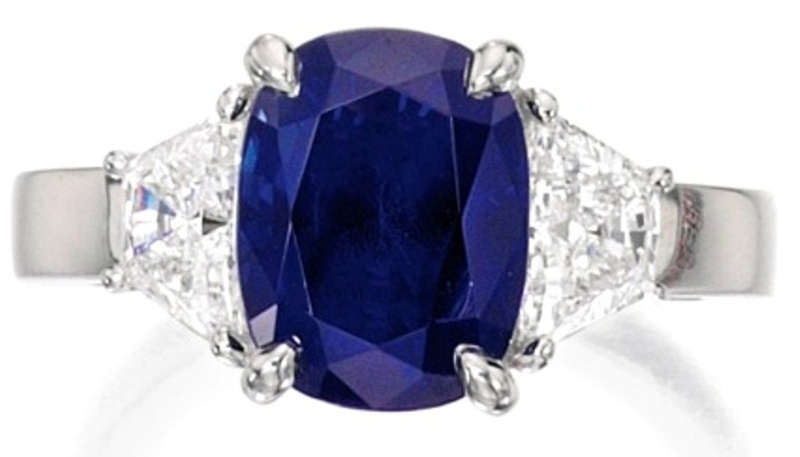 Lot 399 is a lot incorporating Ceylon blue sapphires. The lot titled Platinum, Sapphire And Diamond Necklace, Oscar Heyman & Bros. is a piece from the collection of Lisa Blue Baron, and given a pre-sale estimate of USD350,000-450,000. The 39.4 cm. 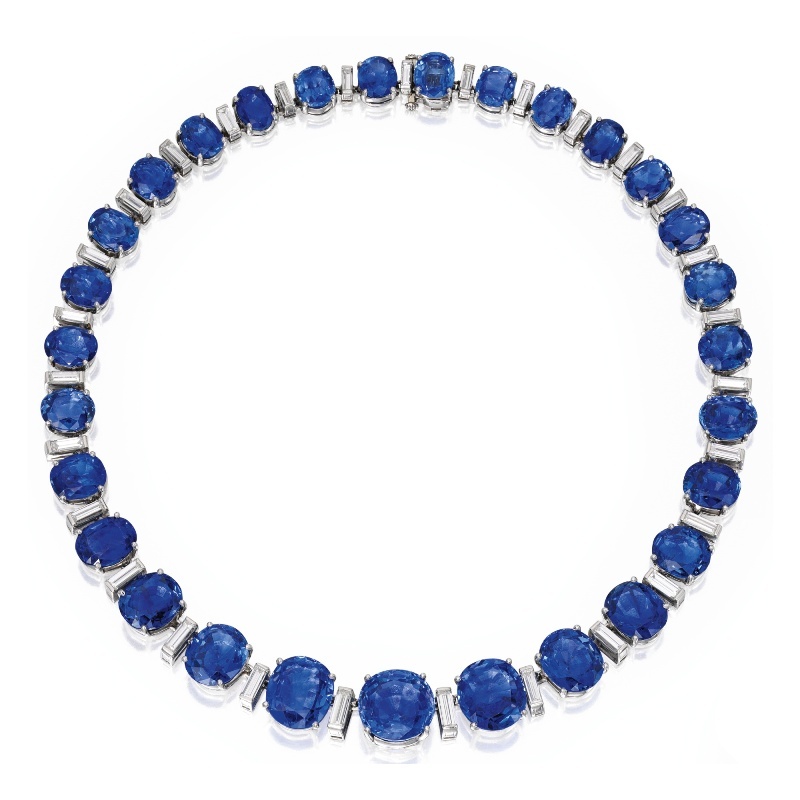 necklace is set with 29 graduated oval and cushion-cut Ceylon blue sapphires. The largest sapphires are set in front of the necklace, the sapphires gradually decreasing in size towards the rear, where the smallest sapphires are situated. The three largest sapphires in front, the largest circular-cut sapphire and the two oval-cut sapphires on either side are respectively 15.30 carats, 10.33 carats and 10.16 carats. The remaining 26 sapphires together weigh 106.00 carats. 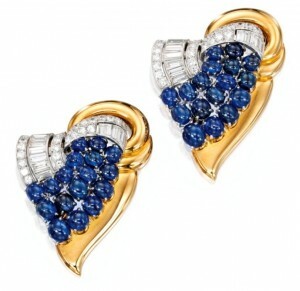 The baguette-cut diamonds set alternately with the sapphires as spacers together weigh 6.80 carats. A lab report by AGL certifies that over 50% of the sapphires tested randomly are of Ceylon origin, with no evidence of heat enhancement. Lot 133 is a Burma sapphire lot titled 18k-Gold, Sapphire And Diamond Pendant-Brooch, Tiffany & Co. said to be the property from a descendant of Thomas Fortune Ryan, with an estimate of USD300,000-500,000. 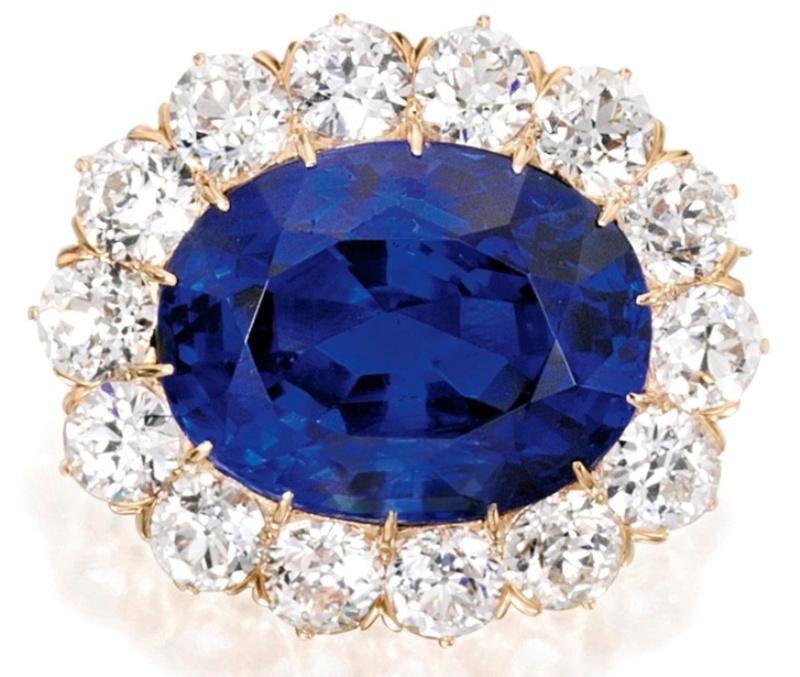 The brooch designed by Tiffany & Co. around the year 1910, has as its centerpiece an oval-shaped Burma blue sapphire weighing 23.49 carats, highlighted by a layer of 14 round Old European-cut diamonds. Two lab reports by AGL and GGL certify the natural Burmese origin of the blue sapphires with no indications of heat enhancement. 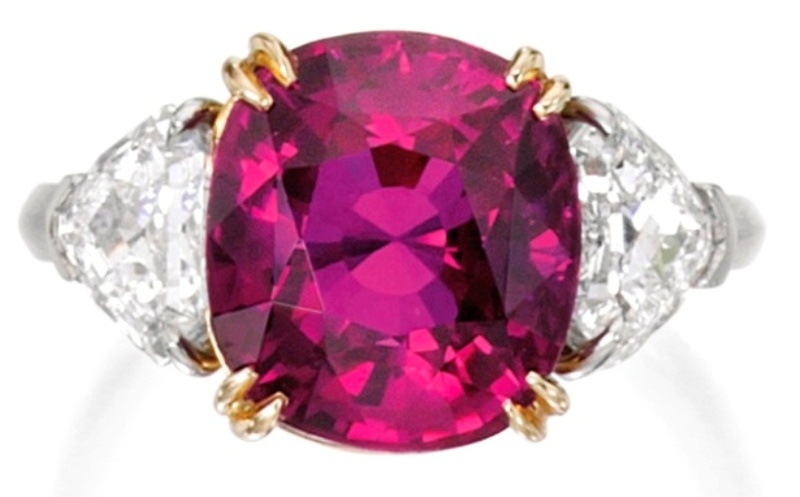 Lot 132 is a Burma Ruby ring titled A Platinum, 18k-Gold, Ruby And Diamond Ring with an estimate of USD400,000-600,000. The centerpiece of this ring is a cushion-cut Burma ruby weighing 7.99 carats mounted and claw-set in 18k-Gold. The central ruby is flanked by two shield-shaped diamonds, mounted on platinum on the shoulders of the ring. The diamonds together weigh 1.35 carats. GGL certifies that the ruby is of Burma origin with no evidence of heat enhancement. Natural Pearl Lots at the sale are led by lots 134 and 135. 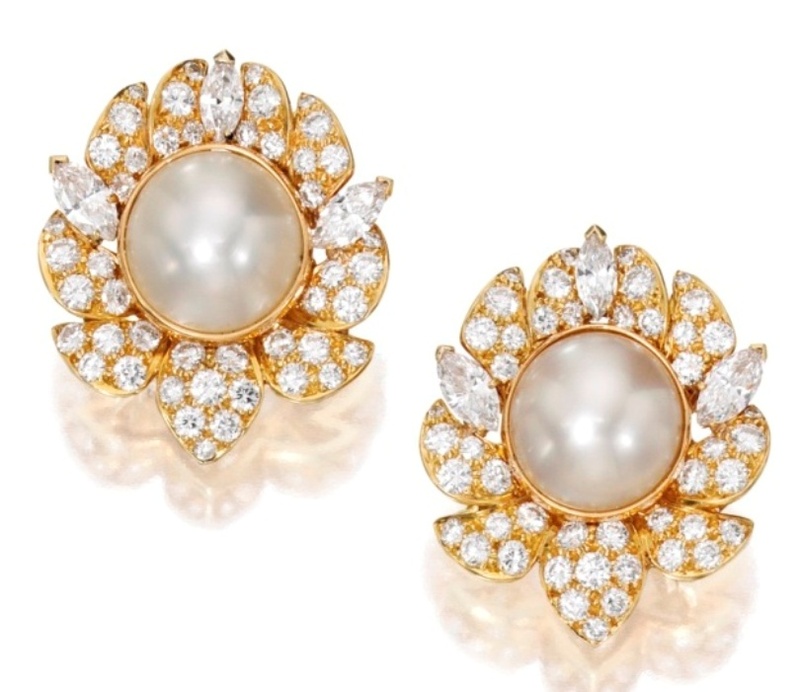 Lot 134 is A Pair of 18k-Gold, Natural Pearl And Diamond Ear Clips designed by Van Cleef & Arpels with a pre-sale estimate of USD250,000-300,000. 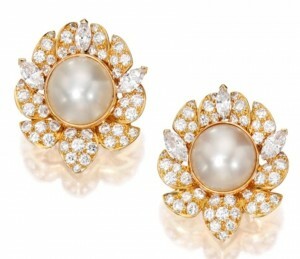 The ear-clips with a floral motif are set with a matching pair of natural button pearls as the centerpiece, with dimensions of 13.4 x 13.3 x 10.3 mm and 13.2 x 13.1 x 10.6 mm. Nine petals surrounding the centerpiece are set with 4 to 9 circular-cut diamonds with a total weight of 4.10 carats. Three marquise-shaped diamonds arising inner to the petals probably represent stamens and together weigh 2.15 carats. SSEF certifies that the pearls are natural and of saltwater origin. 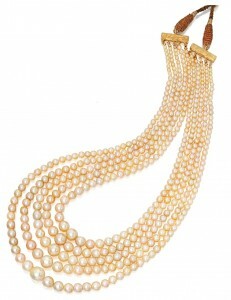 Going by the performance of such natural pearl necklaces at public auctions it would not be surprising if this natural pearl necklace becomes the star lot of the sale, selling many folds above the upper estimate for several million dollars.